“Every heart sings a song, incomplete, until another heart whispersback. Those who wish to sing always find a song. At the touch of a lover, everyone becomes a poet.” – Plato. What better gift can you give a newlywed couple, than sharing your thoughts and giving your regards by quoting from some of the best love poems ever written. You can read them out at the wedding or if you are the one who’s getting married, you can read it out for your partner. 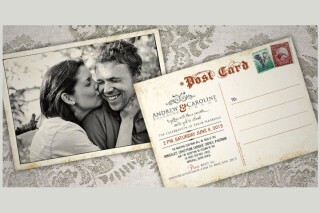 We are sure wherever you quote, these wedding poems are going to pleasantly surprise and please everyone. You can even use them as quotes on a personalized gift – it could be for a personal letter, an engraved message, a picture frame or even a beautiful mug. Sonnet 116 is one of the most beautiful sonnets written by William Shakespeare. This timeless love poem is one of the most well known and recognizable collection of words in the world. The poem is all about love and how it is something that does not change or is something that can ever be erased or removed. Shakespeare states that love is something that doesn’t change and it can’t be removed. He goes on to explain that it is an omnipresent constant which is like “an ever-fixed mark” and that it is “not time’s fool”. 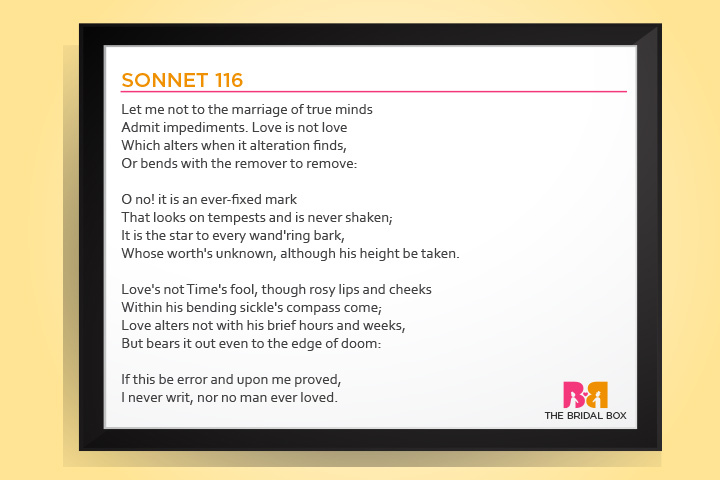 “Love is timeless” is the crux of Sonnet 116 and it sure is something that everyone at a wedding would love to hear and will surely agree to. It consists of fourteen lines and is written in the iambic-pentameter with the ABABCDCDEFEFGG rhyme scheme. 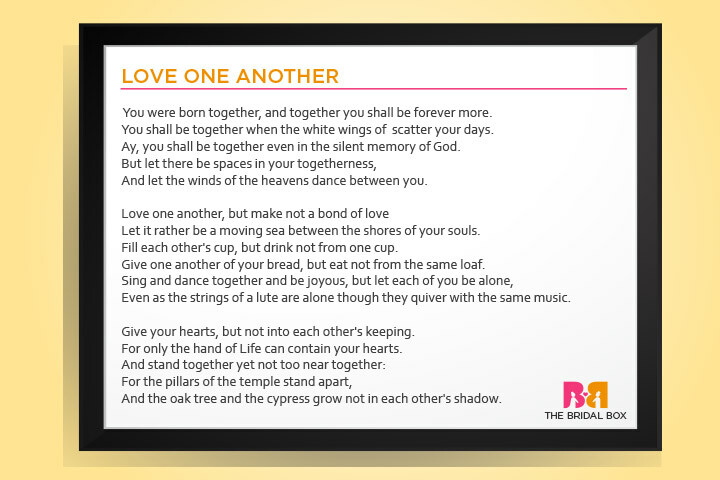 “Love One Another” is an inspiring love poem by the famous Lebanese-American writer, poet and philosopher Khalil Gibran. This poem is an excerpt from one of his most popular and path-breaking works – The Prophet, which was published in the year 1923. This poem is specifically from the chapter titled “On Marriage”. Gibran speaks of love, bonding and togetherness in this poem. And in the same breadth, he also highlights the need for being a free spirit and always protecting one’s own individuality. 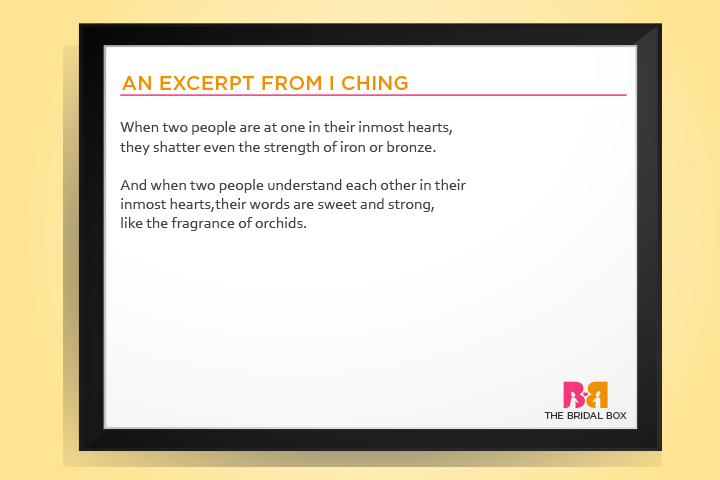 It is one of those wedding poems that can be a beautiful and a thoughtful message for the newlywed couple. Check out the poems here..
“Meeting at Night” is a poem written by the famous English playwright and poet Robert Browning. The poem is about his time consuming and very long journey to the residence of his lover. He beautifully explains the feeling that consumes the couple when they finally meet, with this romantic line “two hearts beating each to each!”. This poem is written as two parts. It is actually a two part poem that can easily be read a single poem with two stanzas. The first stanza talks about his journey and the second stanza is about their meeting. 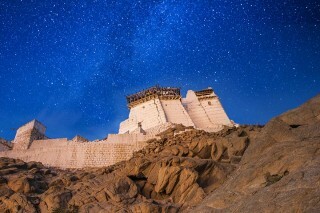 “Meeting at Night” is presented in the ABCCBA rhyming style. 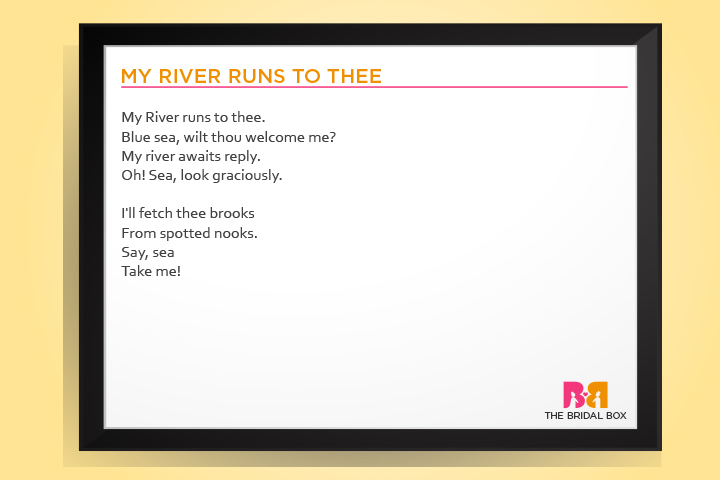 Check out the poems here..
“My River Runs to Thee” is a poem written by the 19th century American poet Emily Elizabeth Dickinson. In this poem, a river is flowing towards the sea bearing many gifts. 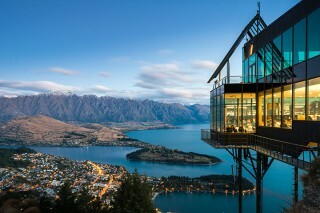 The river asks the sea if it will accept her in all completeness. This poem is more suitable as a personal message which a lover can share with or read to his/her partner than a poem that can be read out for everyone. You can either write it as a small love letter or read for your partner in private during the wedding ceremony, which enhances the poem’s appeal, making it a truly precious gift. 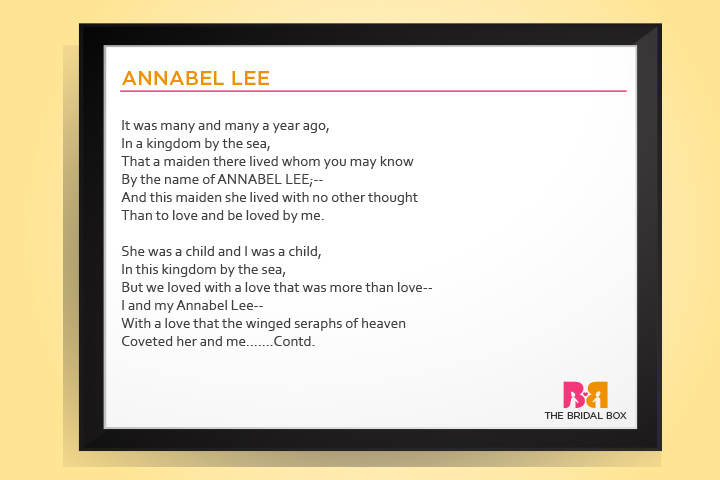 Check out the poems here..
“Annabel Lee” is the American writer, poet and critic Edgar Allan Poe’s last poem. It was published posthumously after his demise in the year 1849. Annabel Lee is an intense love ballad that is presumably about his wife. It is a poem that is more about love and its importance than a mere celebration of love. It is something that deals with not just the beauty of love but also its loss. The rhyme scheme is different than most of Poe’s other poems, as the poet gives each even line an end-rhyme of a long sounding E. Check out the poems here.. The “I Ching” is an ancient Chinese text on divinity and philosophy, based on eight symbolic trigrams and sixty-four hexagrams, which are interpreted with the principles of yin(the shady or negative side) and yang (the bright or positive side). The “I Ching” is one of the ‘five classics’ of the Chinese philosophy – Confucianism. This poem is an excerpt from that text and it talks of love, understanding and the beauty of complete bonding between two people’s hearts. One of the loveliest marriage poems that can be read aloud at a wedding that will surely bring quite a few whistles from the gallery. Check out the poems here..